Steakmaker is one of the signature products from a company that has a HUGE line of spice blends and BBQ rubs. Texas based Obie-Cue has been churning out award winning rubs since 1985. Their Steakmaker grilling spice is one of their most noteworthy blends. 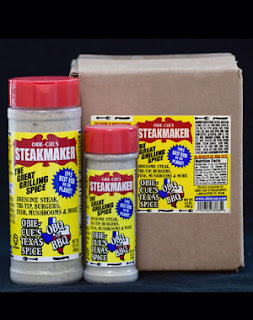 Steakmaker has earned acclaim from a variety of sources including being named "Best Rub on the Planet" at the 1995 American Royal. Obie-Cue's Steakmaker combines all the classic flavors that are traditionally used to compliment beef. The first ingredient is Worcestershire. Though most are familiar with Worcestershire Sauce, Steakmaker uses the essence and flavor of Worcestershire in dry powder form. Additionally, Steakmaker includes salt, pepper, garlic and onion and even lemon flavor. Upon opening the 4.8 oz shaker, the Worcestershire and lemon scents were both evident. The lemon aroma was fairly intense. I was a little concerned how it would translate on grilled beef. Thankfully, the lemon flavor isn't nearly as pronounced as the aroma. The lemon citrus was barely an afterthought when I applied it to grilled buffalo burgers. The Worchestershire flavor was noticable, but mild. Steakmaker is a finely ground blend. Because of the small grains of spice, the flavors are very mild unless it's applied heavily. Generally, I prefer a coarse ground rub for steaks and burgers. Beef benefits from the big, bold flavors provided by large flecks of garlic and black pepper. Overall, Steakmaker was an adequate compliment to grilled beef. The classic combination of Worcestershire, onion, garlic, salt and pepper are hard to beat. The lemon, though aromatic, does little for the flavor. While I would prefer an all natural, coarse grind, Steakmaker is a safe choice for seasoning steaks and burgers. To learn more about Obie-Cue's rubs, click here to visit their website. See how Steakmaker rates on our "Product Reviews" page. 0 Response to "Obie-Cue's Steakmaker"